In Financial Models with Lévy Processes and Volatility Clustering, the expert author team provides a framework to model the behavior of stock returns in both a univariate and a multivariate setting, providing you with practical applications to option pricing and portfolio management. They also explain the reasons for working with non-normal distribution in financial modeling and the best methodologies for employing it. The book's framework includes the basics of probability distributions and explains the alpha-stable distribution and the tempered stable distribution. The authors also explore discrete time option pricing models, beginning with the classical normal model with volatility clustering to more recent models that consider both volatility clustering and heavy tails. 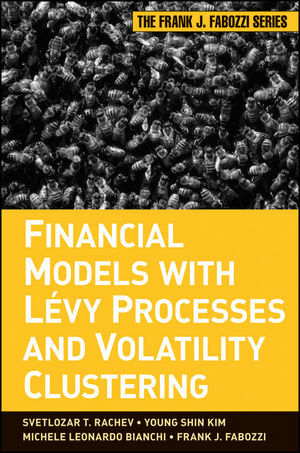 Financial Models with Lévy Processes and Volatility Clustering is a thorough guide to classical probability distribution methods and brand new methodologies for financial modeling. SVETLOZAR T. RACHEV is Chair-Professor in Statistics, Econometrics, and Mathematical Finance at the Karlsruhe Institute of Technology (KIT) in the School of Economics and Business Engineering; Professor Emeritus at the University of California, Santa Barbara; and Chief Scientist at FinAnalytica Inc.
YOUNG SHIN KIM is a scientific assistant in the Department of Statistics, Econometrics, and Mathematical Finance at the Karlsruhe Institute of Technology (KIT). MICHELE Leonardo BIANCHI is an analyst in the Division of Risk and Financial Innovation Analysis at the Specialized Intermediaries Supervision Department of the Bank of Italy. FRANK J. FABOZZI is Professor in the Practice of Finance and Becton Fellow at the Yale School of Management and Editor of the Journal of PortfolioManagement. He is an Affiliated Professor at the University of Karlsruhe's Institute of Statistics, Econometrics, and Mathematical Finance and serves on the Advisory Council for the Department of Operations Research and Financial Engineering at Princeton University. 1.1 The need for better financial modeling of asset prices. 1.2 The family of stable distribution and its properties. 1.3 Option pricing with volatility clustering. 1.6 Organization of the book. 2.4 Statistic moments and quantiles. Chapter 3 Stable and tempered stable distributions. Chapter 4 Stochastic Processes in Continuous Time. Chapter 5 Conditional Expectation and Change of Measure. 5.1 Events, s-fields, and filtration. Chapter 6 Exponential Lévy Models. 6.2 Fitting a-stable and tempered stable distributions. 6.3 Illustration: Parameter estimation for tempered stable distributions. 6.5 Appendix : Numerical approximation of probability density and cumulative distribution functions. Chapter 7 Option Pricing in Exponential Lévy Models. 7.2 Boundary conditions for the price of an option. 7.3 No-arbitrage pricing and equivalent martingale measure. 7.4 Option pricing under the Black-Scholes model. 7.5 European option pricing under exponential tempered stable Models. 7.6 The subordinated stock price model. 8.2 Simulation techniques for Lévy processes. 8.4 Tempered infinitely divisible processes. Chapter 10 Non-Gaussian portfolio allocation. Chapter 11 Normal GARCH models. 11.2 GARCH dynamics with normal innovation. Chapter 12 Smoothly truncated stable GARCH models. 12.2 A Generalized NGARCH Option Pricing Model. Chapter 13 Infinitely divisible GARCH models. 13.3 Non-normal infinitely divisible GARCH. 13.4 Simulate infinitely divisible GARCH. Chapter 14 Option Pricing with Monte Carlo Methods. 14.3 Performance of Option Pricing Models. Chapter 15 American Option Pricing with Monte Carlo Methods. 15.1 American option pricing in discrete time. 15.2 The Least Squares Monte Carlo method. 15.3 LSM method in GARCH option pricing model.